The apparent lull on the Arduino front the last few weeks was just the calm before the storm that is the Bay Area Maker Faire (BAMF). Both companies claiming the Arduino name were there over the weekend, with news and new products in tow. Ironically, you could see from one booth straight over to the other. Small world. Perhaps the biggest news from Arduino LLC is that hacker-friendly Adafruit is now going to be making officially-licensed boards in the US. Competing with this news, Arduino SRL brought its new boards, including the Yun Mini and ARM-powered Arduino M0. And [Massimo Banzi] and Arduino LLC seem to be taking an end-run around the Arduino SRL trademark by announcing the “Genuino” brand for European production. For all the details, read on! It’s no secret that Maker Faire is highly geared toward the younger crowd. This doen’t mean the Faire is completely devoid of the historic; the Bay Area Maker Faire is right in the heart of the beginnings of the computer industry, and a few of the booths are showing off exactly how far computers have come over the last forty years. [Vince Briel] of Briel Computers has a booth showing off his wares, mostly modern reimaginings of vintage computers. His table is loaded up with replica 1s, a board that’s much smaller but still completely compatible with the Apple I. The MicroKIM made an appearance, but the crown jewel is [Vince]’s Superboard III, a replica of the Ohio Scientific Superboard II. It’s your basic 6502 computer with 32k of RAM, but unlike just about every other modern retrocomputer out there, [Vince] put the keyboard right on the main board. The switches are Cherry MX, the keys are from WASDkeyboards. [Vince] is actually getting a lot of interest in making modern ASCII keyboards to replace the old and busted boards that came in the home computers of the 70s and 80s. That might be a project [Vince] will release sometime in the future. [Steve Jobs] may have been the father of the Macintosh, but he was, by no means, solely responsible for the Mac. It was a team of people, and when you talk about the UI of the Mac, the first name that should come up is [Jef Raskin]. One of [Jef Raskin]’s finest works was the Swyft Card, an add-on to the Apple II that was basically just a ROM card that had an OS and Forth interpreter on it. The distinguishing feature of the Swyft card was the use of ‘leap’ keys, a simple way to change contexts when using the computer. 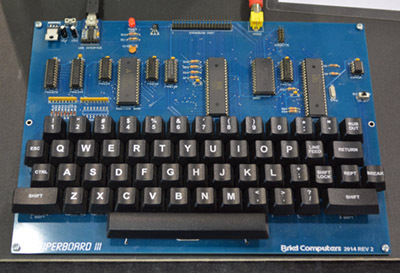 We’ve seen replicas of the Swyft card before, courtesy of [Mike Willegal] at the Vintage Computing Festival East. [Dwight Elvey] of the vintage-computer.com forum brought a few extra special items related to [Raskin] and the Canon Cat. The first was a Swyft card installed in an Apple IIe. The second was a prototype Swyft computer, with SERIAL NUMBER 1 printed on a Dymo label and fixed to the case. The ‘woodie’, as [Dwight] calls it, has two 1.44 MB disk drives, of which half of the disk is actually usable. [Dwight] didn’t take the machine apart, but I’m 99% sure the CRT in it is the exact same tube found in early 9″ Macs. Also in [Dwight]’s display is a production Swyft computer and a Canon Cat, the final iteration of [Jef Raskin]’s idea of what a text-based computer should be. 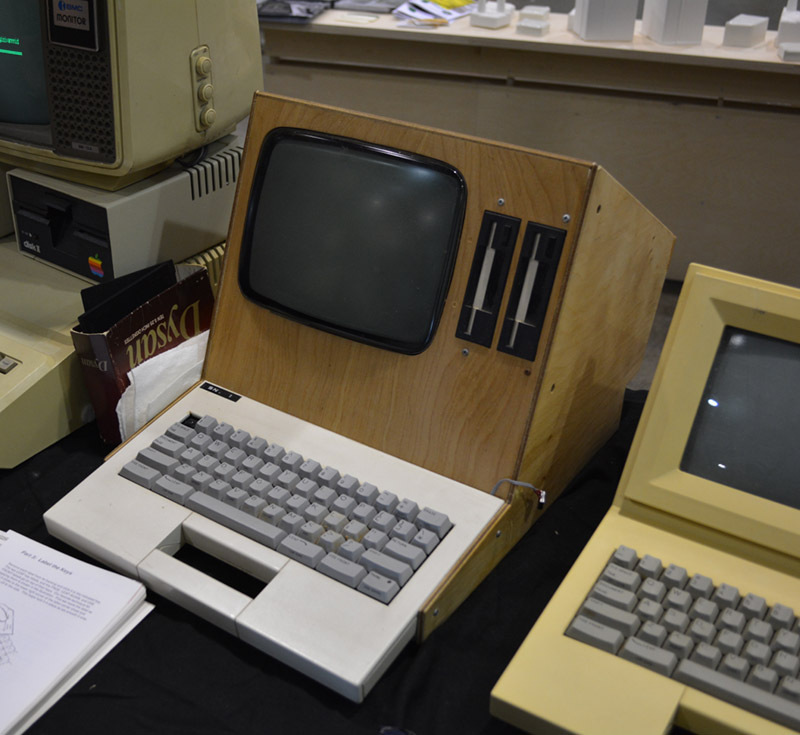 The vintage-computer booth also had a few interesting retrocomputers including a Commodore 128D, the Apple made, Bell & Howell branded Apple II, and an Amiga 2000. Right next door was the Computer History Museum, who brought a very kid-friendly storage medium display. Showing a 10-year-old an 8″ disk is fun. Analog computer from the Computer History Museum. It was display Chua’s Circuit.